Two art exhibits using a common theme opened in the Metro area for April; RNG Gallery in Council Bluffs with Once Upon a Time: A Twisted Fairy Tale and Hot Shops in Omaha, with a more traditional take called Once Upon a Time: Fairy Tales and Children’s Rhymes. This hands local viewers an interesting, perhaps even inevitable comparison of the two very different approaches. For the former, Random Arts Omaha, a new gathering of young women led by organizers Laura Vranes and Nadia Shinkunas started the ball rolling with what they called an “edgy, gritty, dirty” call to their roster of young women, asking for a re-look at what their childhood tales and Disney have dished out for today’s women. While they got a variety of responses from this all-female team of artists, most viewers will see a wide array of media showing technical virtuosity and a considerable amount of thought. Most of the artists are recent graduates from art schools, and well attuned to the latest in aesthetic approaches. 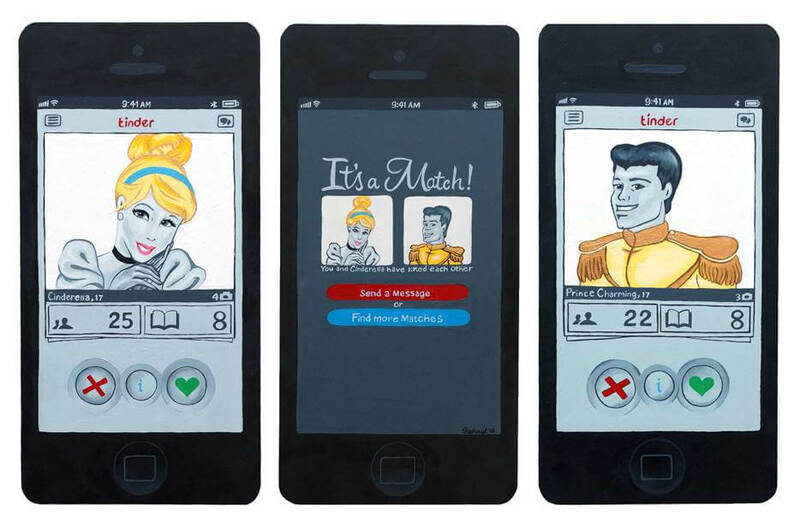 Courtney Kenny Porto’s “Swipe Right” based on the Cinderella story, addresses today’s technological approach to dating, which she sees as empowering for women who wish to look for the right man in a proactive approach. Nicole Roberts’ “Transformation” seems to come closer to gritty, with her portrait of a woman becoming a vampire, with all the trappings—teeth, scales and horns. Ceramicist Lauren Baird presents several very different and spot-on representations of relevant clay pieces—perhaps most successful and interesting visually is her “Trapped in a Daydream,” a large-scaled and dimensional figure of the erstwhile queen and talking mirror tale from long ago. The four oil paintings of cloaked figures on stilts by Xuan (pronounced “swan”) Pham might well prove both elegant and mysterious to the public. Called “How many Masks Can I Wear?” the pieces show a large and aggressive male in two of the works, then groupings of huddled women, smaller and frightened. Done in a sure hand, these pieces seem to quietly suggest a historical context of the place of women in so many cultures. Elizabeth Rage combines fashion and photography with two lovely self-portraits—“Slave to Disney,” and “Everyone Wants to Be a Disney Princess”—she’s a lovely woman with tongue-in-cheek titles. One of the largest pieces in this RNG exhibit is by Norm Foreva, a self-taught artist who works mostly in painting large-scale murals. Foreva presents a large watercolor and ink piece, filled with delicate detail. And Marie-Elena Schembri’s silver gelatin “Barbie” prints in elegant whites against black are yet another of the many approaches in this thoughtful group show. Turning to the huge Hot Shops exhibit Fairy Tales and Nursery Rhymes by Omaha Artists, Inc, the visitor might be rather overwhelmed with the number of works presented. But by giving the show some time to go through, several will stand out because of the lovely color or style of working, and the careful observation and technical abilities of this group. One outstanding example is Debbie Plog’s well-conceived watercolor rendition of “Jack and the Beanstalk”, which shows a modern child discovering that he can climb high into the air. It would seem that the huge Omaha Artist, Inc. exhibit at Hot Shops has suffered from the simple instructions given to its members. The artists were asked to “update a fairy tale or nursery rhyme.” Perhaps they weren’t challenged quite enough? This certainly is a talented and seasoned group of artists, well versed in techniques and long experienced with working to develop their skill. Along with a smattering of males, it’s heavily weighted to female painters who have spent years developing their abilities. But some of the works appear to have been previously painted—and the artists seem to have found a fairy tale or nursery rhyme to fit the work they had already executed. One might guess that “updating” to many of the participants simply meant for them to choose a topic and work in their own particular style. There seem to be no examples of their thinking about how our culture is preparing our children, any better than the old fairy tales did, with ogres and witches to frighten, and the need for magic to better one’s life. Perhaps this doesn’t matter to most, as the work is competent and varied in approach. But to update an old trope such as a fairy tale or children’s rhyme seems to demand that the artist go beyond the depiction of a visual piece to suggest a meaningful statement for today’s world. Disney Films has long covered the excitement and glory found in the old fairy tales and stories with a technical virtuosity we all marvel and love to enjoy—possibly for their beauty, rather than any realistic application to our own lives that could be made. But painters can’t do what film and lots of experts can. That well may be why many artists work in a nonobjective approach—then, they can play with color and shape, and not be concerned with content, or meaning. But given the directive that one “updates” an old story, it seems that the artists in this case might want to think about what needs updating, and what our culture is currently doing to shape us and those around us. Perhaps what they could have done was to offer their responses to what we each can do to make our own and others’ lives work better for us without the need for magic? An alternative might be to exaggerate or make fun of what movies and magazines seem to expect of us. A Twisted Fairy Tale continues until April 7 at RNG Gallery located at 157 W. Broadway, in Council Bluffs; Fairy Tales and Children’s Rhymes continues through April at Hot Shops, 1301 Nicholas Street, off Cuming.